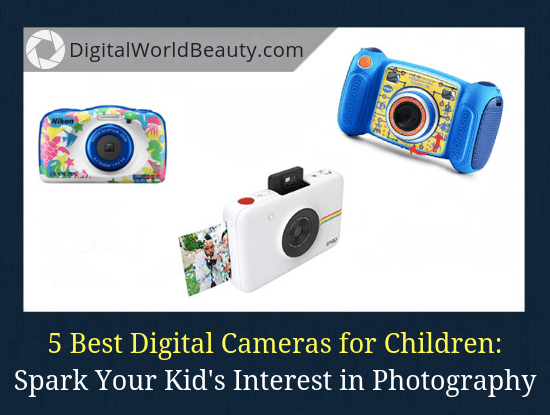 If you yourself own a digital camera, you likely sparked your child’s interest in photography. If that’s true, then it’s time to think about (awesome) photography gifts for kids. 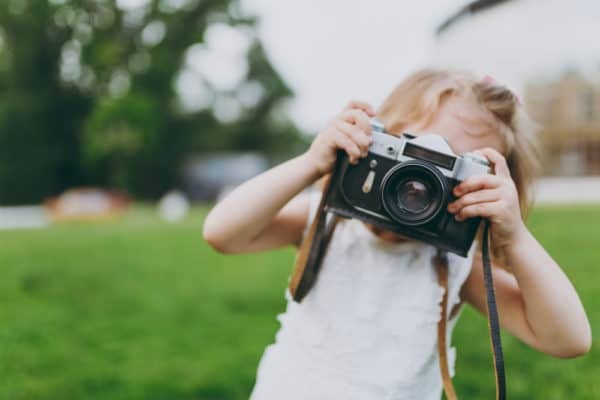 I’ve prepared the top 5 list of best digital cameras for children in 2019. Something tells me that they will be ecstatic about having their own photography gear. How to Choose the Right Kid-Friendly Camera? While it might seem that selecting a camera for your child is tricky, it’s actually pretty simple. The good news is that children don’t really need a lot of complicated camera settings. What they need is a straightforward camera that is also able to withstand the series of unfortunate events that they will befall it. So, you MUST get durable digital cameras. Ready to find out which one can take a beating? OK for kids under 5 y/o? – Yes. If you feel that your kids are old enough and would prefer an “adult” camera with children’s menu, then I encourage you to check out Nikon W100. It’s also one of my recommended cameras for family vacations (with children). W100 is a camera for the whole family use, not just for the kids. The design of the control system resembles a pocket game console. The buttons on the Nikon Coolpix W100 are large and comfortable. This camera can withstand a drop from a height of up to 1.8 meters and dive to a depth of 10 meters. It’s also capable to handle a cold weather of up to -10 °C, while retaining all its technical capabilities. When you turn on the camera, on the screen you will see “waterproofing precautions” greeting. Basically, it will guide you through so that water doesn’t get into the camera when you’re using it underwater or in bad weather conditions. … Or when anything else that may get inside your battery compartment. Make sure to follow the guidelines closely to avoid any issues while shooting pics under the water! 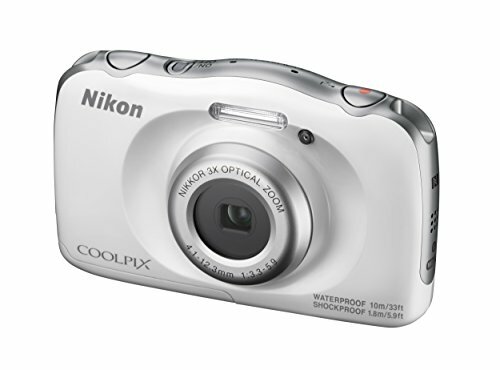 It’s a child-friendly digital camera and is great for family use. Remember though that it costs less than $200 and you shouldn’t expect a top-notch photo quality. Your kids however will definitely enjoy it. For those of you who often go on family vacations and prefer adrenaline-filled trips, this camera is gorgeous. OK for kids under 5 y/o? – No. Just like Nikon W100, this camera is best for your older kids. 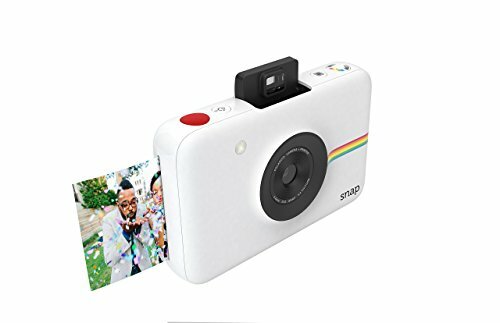 For 5 year-olds or less, it’s not the best option for a number of reasons, but for the 8+ year-olds Polaroid Snap will be a unique gift. At first, I was doubting between Fujifilm Instax Mini 9 and Polaroid Snap. and is convenient in size. Polaroid Snap is an “instant” camera. Basically it’s a digital camera with a built-in printer. While to you it might be a thing of the past, for your children it will be unlike anything else. This Polaroid was built with simplicity in mind, so it’s very easy for kids to use. The good news is that it comes with a built-in Li-on battery, so you can recharge it with your USB cable. While the body is made of hard plastic and can withstand minor hits, it’s best to use a wrist strap that is included to avoid accidental drops. Below Chelsea and her daughter talk about Fujifilm Instax vs Polaroid Snap, which will help you understand which camera suits best for your child. Get 16GB or 32GB microSD card with it so you can update the firmware. Like what the lovable Dory says in the movie Finding Nemo, you can just keep swimming and swimming. … They can also take pictures while underwater! Why do I recommend this camera? These 3 reasons already should be enough to want Ytat. First of all, this baby is small and lightweight and runs on 2 AAA batteries. I don’t think your kid will care about its two-inch LCD screen that shows 12 million pixels, but I have a feeling that s/he will definitely enjoy playbacking the video that s/he just captured. This camera’s control panel is pretty straightforward with easy-to-press buttons within. 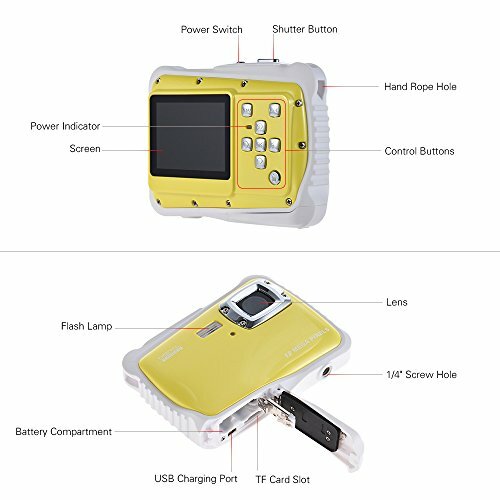 Capturing photos during the night is also not a problem because this Ytat has a bright flash. Other people have used it to capture the precious moments of their baby. It offers various photo resolutions (12.0, 8.0, 5.0, and 3.0 MP) as well as different video resolutions (720P, 480P, and VGA). Available in 2 colours: red and yellow. I feel this this might be the best toy camera for kids for any occasion, especially for around $50. I tagged this camera as the kiddie digicam because its functions are just like that of a regular digital camera. The only difference is the funky design and simpler buttons. Vtech Kidizoom is a 2.0-megapixel camera designed with a digital zoom that can zoom in 4x and with an ability to record videos. There is also a built-in micro SD card slot to allow for more storage. It’s one of the best cameras for kids to use, especially if they are 3-6 years old. 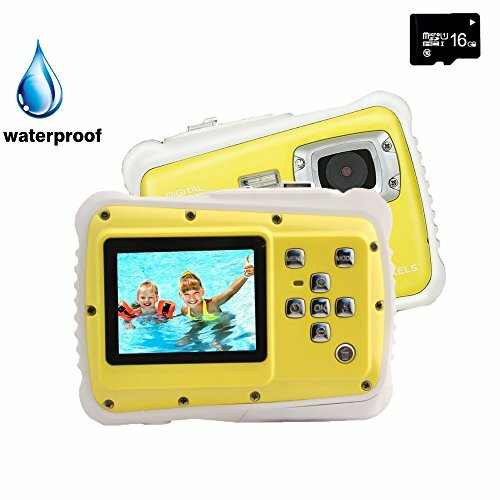 It’s a durable kids camera and is designed to survive any tumbles and drips. There is also a selfie mode that can automatically detect your kid’s face. It has photo collage templates, so your kids can enjoy editing the photos and adding effects. Vtech Kidizoom has 4 games. This means that your children won’t get bored after taking some fun photos because they can also play the games in the camera. Personally, I have a habit of checking the battery life aspect of digital technology. And what I liked here is that this kids camera automatically turns off when not in use, which therefore prolongs battery life. You’ll need 4 AA batteries for this one. If your children are under 10 years of age, I am sure they’ll love it. OK for kids under 5 y/o? – Yes, it’s perfect. At one point in time, you might have owned an older version of this camera. It has simple features and controls that were made especially for toddlers and kids up to six years old. Needless to say that it’s a shockproof camera, so no amount of dropping and banging will leave this camera broken. The Fisher-Price has a digital zoom that can zoom 4x. You can download a lot of special effects and frames. These effects are not applied after the photos are taken. Instead, they are applied while taking the photos. In Fisher-Price, the low light performance is better and it has a built-in memory that can house more than 2000 photos. Its colored, 1.44-inch TFT screen allows for photo and video playback. 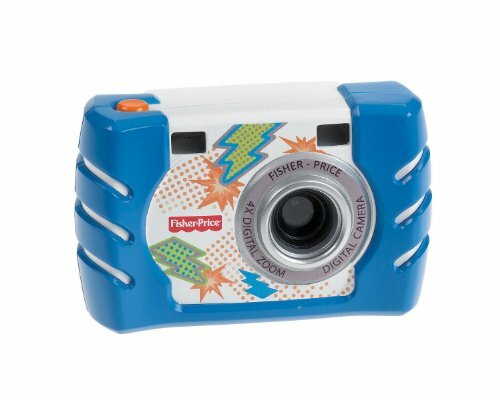 Fisher-Price Kid-Tough might be the best beginner camera for a child. It’s a bit pricey but it sure makes a great gift. (Excellent photography gift for kids under 7 years old). Just like what I said before, all 5 cameras are great for children. However, you might have noticed that each of them excel in a specific field or is good for a particular age group. You should decide what’s the best camera for YOUR kid to use. and lastly, there’s also a no-fuss camera that is built to last. It really depends on how old your child is. 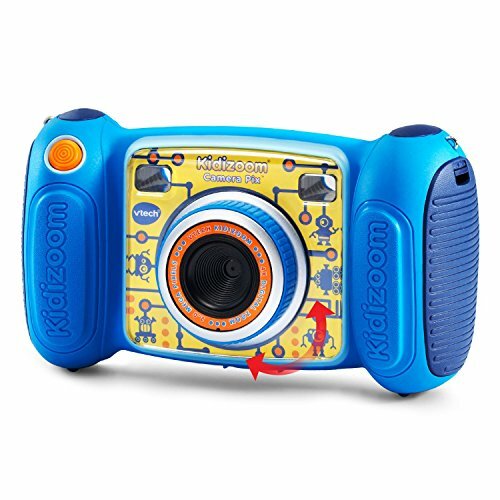 If I were to name just one for little kids, I’d recommend checking out VTech Kidizoom Camera Pix on Amazon. Because unlike previous years, children have become smarter and more demanding. In a world full of tablets and smartphones, your child will surely appreciate a camera that closely resembles that of the real deal, instead of it looking like a toy. These cameras all cost under $200 or even under $50. You shouldn’t expect a high image quality but what we are looking for here is the experience that your child will have when he or she is using the camera. With the one from VTech, definitely, your child will feel like he or she is a professional photographer. All of the above make great photography gifts for kids. Which of these 5 top rated kids digital cameras you’d get as a gift in 2019? Let me know any thoughts, questions, and/or suggestions in the comments! Personally, I like Nikon cameras and my nephews birthday is coming up shortly. He really like using my digital SLR, which did cost me several thousand dollars. I don’t mind him using it, but I have to say I get concerned because I don’t want him to break it. I do like the Polaroid Snap one. I think the Polaroid idea is good. Because it can print the pictures out. However, how much are the Polaroid pictures? Also, do they happen to have a waterproof version of this camera or is there a similar model that does the polaroid photos and is also waterproof? Hi Garen, apologies for the late reply. Tell me about it! I have 2 nephews and 1 niece, aged 4, 3 and 1 respectively and every time my brother’s family visits me, I ALWAYS hide my laptop, smartphone and every other technology I care about lol. Excellent questions you got there. Personally, I love Polaroid Snap – it reminds me of childhood 🙂 And for kids that are used to everything digital it’s a unique gift (at least that’s my opinion). If you purchase Polaroiz Zink 50-pack photo paper, then it’ll be around $25 on Amazon. Buy enough in advance though! They will be used up very quickly, especially in the beginning. As far as I know this camera doesn’t have a replacement plan. I think it’s best to give it to older kids who are a bit more careful with technology. The camera itself isn’t waterproof but Polaroid Zinc photo paper is water resistant (and hard to tear). Frankly, I don’t think there’s any instant camera on the market that is waterproof. I hope this helps and I hope your nephew enjoys his new camera as a birthday gift! 1) What is the goal? Is it just for the child to have fun? Do you want to teach them photography fundamentals? Is it to help them express themselves? 2) How old are they? I’d argue handing a camera to a 5 year old is much different than a 10 year old. 3) Is the kid interested in photography? This one question can help to make a decision between a camera and a phone or tablet that allows them to share photos on whatever the social media flavor of the day is. This might help spark interest in photography. You’ve listed some great options here and I like the option of an “instant” print with digital storage as that gives you many options when it comes to instant satisfaction and the ability to edit or enhance later. Today it’s hard not to simply hand out a phone or tablet. One down side is, they may never use it for photography and, if that was what you were hoping to spark an interest in, you effort may be wasted. In the end, you have to weigh the pros and cons of each option and come to a decision. Offering a little help/encouragement will go a long way toward nurturing that talent. Without a doubt, just like it is for adults, there are a lot of factors to consider when choosing the right camera for kids. Honestly, you nailed it with the questions to ask, I don’t even know what else I can add here. – “Offering a little help/encouragement will go a long way toward nurturing that talent.” – I agree. Personally, I developed a passion for photography pretty late and I wish my parents encouraged us more to reveal our artistic talents, since we were kids. I even had a little debate with my mother about purchasing the cameras for my nephews aged 4, 3 and 1. She doesn’t understand why kids under 5 years old would need such gifts, and I say it might help them stimulate their artistic nature and reveal their photography talent. Not to mention that it’s fun. The GordVe Underwater Digital Action Camera is a very good camera. I got this camera for my son who is now 7 years old. He loves it and I think it’s a good beginner camera for kids. I really like it and for the price, you certainly can’t go wrong. The rubber border is a lifesaver because my son has hit it pretty hard and it literally saved the camera. Probably going to be purchasing another one shortly. Currently have the yellow one, but might get the orange one, too. 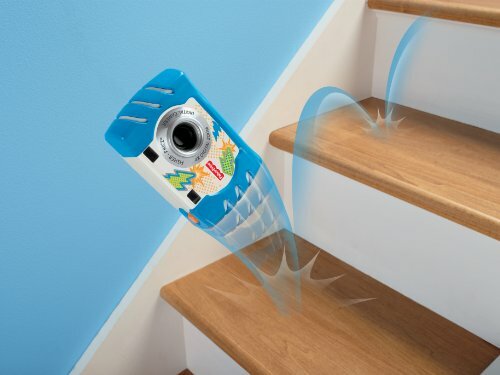 However, the Vtech Kidizoom Camera Pix does look pretty cool, too. It looks like it’s about 15 dollars cheaper. Do you think it’s worth buying the cheaper one? Or maybe how do the two cameras compare to each other? Thanks for sharing your experience with it GordVe waterproof camera. I mainly like it for its fun design and the ability to take sweet shots underwater, young children definitely love it! Like GordVe, Kidizoom also is more of a toy than a serious camera, so the quality of images will be OK. It’s aimed at children ages 3-8, so your child might still enjoy and find it interesting. Keep in mind though that the kids in the 21st century get quickly familiarized with digital technology, so he might quickly get bored with it. You might want to consider Nikon W100 compact camera instead. What I like about it is that it works well both for children and their parents, especially popular during vacations. Hence the reason why I call it a family camera. If it’s not a surprise camera gift for Christmas or something, you might want to ask your son which of the mentioned cameras he likes best. Thank you for this informative review! The GordVe (known as Ytat?) underwater camera and the VTech Kidizoom both look like exactly what I’m looking for to get my son for his birthday. You mentioned that both are lower quality pictures though. Do you know which one would take higher quality images? I usually review high-end digital and mirrorless cameras, so of course any camera under $200 won’t be on par with those. But in this case, it’s kids digital cameras we’re talking about and certainly they won’t be as picky with image quality as adult photographers will. They offer different resolution, GordVe (yes, before called Ytat) has 12 MP and Vtech Kidizoom Pix has 2.0 MP resolution – certainly a huge difference. But the latter gives actual digital photographers and will make your child under 7-8 years old feel like he’s a real photographer. Also, based on what I’ve seen Vtech Kidizoom Pix certainly is more popular among buyers. If you share how old your son is and what your budget is, I will be able to help better in making a decision.